OK, I'll admit it. 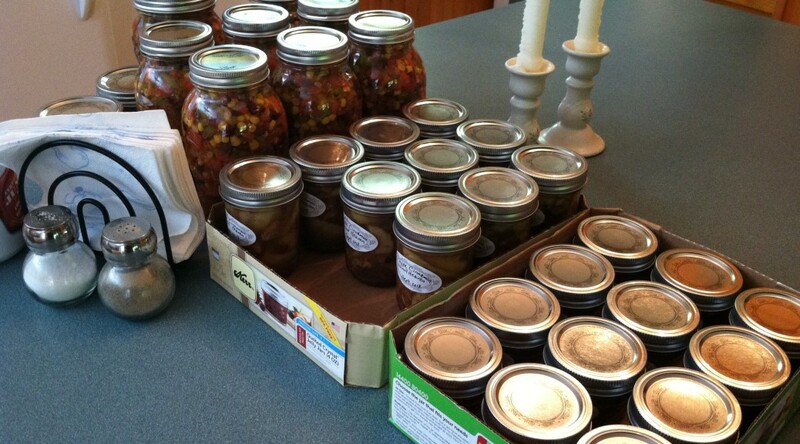 There is a distinct satisfaction I get from canning food. The endorphin release from the sound of "plinking" as the metal lids on the jars seal after taking them out of the canner gives me a great feeling knowing I have succeeded . Knowing how to preserve healthy food without icky chemical processes or worries about what went into it is not just for your Grandma any more. In the age of internet, we circulate gourmet recipes to can salsa that makes your eyes roll back and soups to have you swear off tin cans for good. My favorite came from a friend I met on the internet who was kind enough to hold my hand virtually while I graduated from "water bath" canning to the ominous pressure canner lol. Not only did I make a lifelong friend, I scored her recipe to near duplicate P. F. Chang's bourbon chicken. Canning these types of meals add a whole new facet to convenience food. If you can serve it over rice or pasta, you can probably find a mouth watering recipe to can it. Jams, jellies, fruits, veggies, meats, sauces and more... Below I have included many helpful links as well as places to find new recipes and ideas. Please feel free to share your thoughts, links and concoctions below. If there are enough of us chiming in, I will create a forum for us to chat over on the Insane Asylum discussion boards. What are you canning?